This is very interesting because, of all of the cards that we for sure know will be in the set, none of them have any value. Of the cards, the most expensive is Griselbrand The other two, Stoic Angel and Domri Rade are worth less than 7 dollars, and will probably tank to 1 or 2 dollars after the reprint. 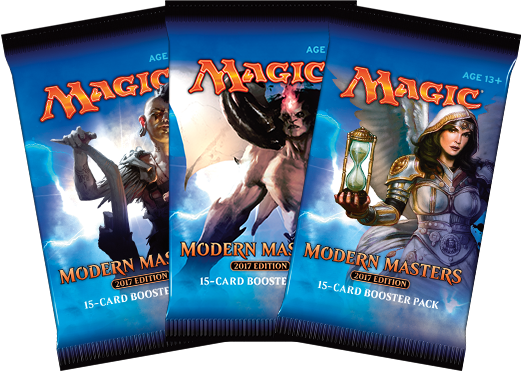 The new art on the Booster Box is probably Snapcaster mage, which would be a much needed reprint. I think the original Volkan Baga art is probably better, although we haven't seen the entire new art yet, so there is no way of knowing. 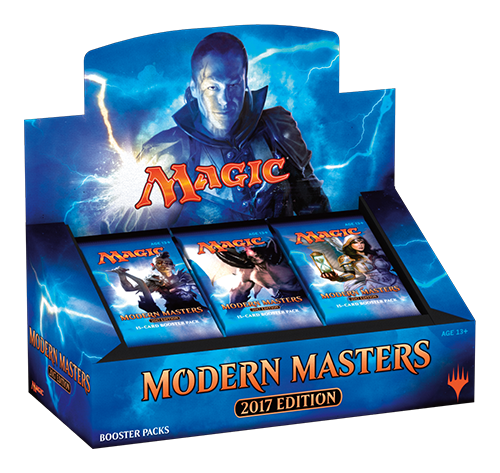 Prediction number one: MM2017 Will be a 3 Color Draft Format. Dragon's Maze: Every 2 Color Combination, Only Multicolor Uncommons. 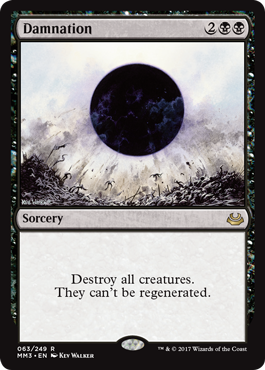 Prediction number Two: MM2017 Will have mostly valuable uncommons. Prediction number Three: MM2017 have the RTR shocklands as uncommons. This probably won't happen, but imagine if you opened a pack of MM2017 and got a Steam vents or an overgrown tomb, and a sweet rare on top of that! I think this would be a great way to reduce the price of modern while still keeping MM2017 fixing really sweet. Do you agree with my predictions? I will be back tomorrow with the spoilers, so stay tuned! Predictions 1 and 3 and both very unlikely. Prediction 2 is right, but there won't be an abundance of pricey uncommons. @Lujikul I agree the zendikar fetchlands need a reprint, although I don't think this is the best place for them. I would rather see them in Amonkhet or some other block set. Damnation is also reprinted! Along with Ravnican Gates and tri-colored lands. Looks like rule #1 is partially correct, #2 will have to wait, and #3 is false. Weighing on others opinions: What do you think the chances that Snapcaster Mage would be reprinted for the set with the booster box art? Or is WotC trolling us with new Tibalt the Fiend-Blooded art? @KrampisZman If you played standard during Khans standard, then you'd know why reprinting fetch lands in standard is a bad idea. Costs aren't helped at all, in the short or long run. @Lujikul I played during Theros-Khans standard and I happen to think it was one of the best standard formats ever. There were very few decks you couldn't play, and I 3-0'd FNM multiple times running different decks. I played Temur Ramp, Mono-Blue Draconic Control, and I even played a weird infinite combo deck that I pulled off of the internet. Snapcaster Mage! Venser Shaper Savant! Bonfire of the Damned! And Ranger of Eos! I would say prediction number 2 is holding pretty strong as of right now, no? Celebrating the reprint of Zur the Enchanter with this cool card! @KrampisZman The issue isn't playability, though it did contribute to Khans/ BFZ being a lack of fun. It's the fact that prices remained really expensive, instead of lowering them for even a short period of time. @Lujikul but the prices DID in fact reduce. Polluted Delta was 100 dollars before the reprint in khans, but now you can have an entire playset shipped to your door for less than 70 (it is about 17 dollars according to MTG stocks mid prices). Even the enemy fetches saw a reduction in price for a time, and while they did start to rise again, this was mainly because of low supply. If you look at a card like Nobel Hierarch which has only been printed in it's original set and 1 of the 2 modern masters sets, you would see that, while the reprints did help with price control for about a year, they would rise up to a price that can be equated to their original price. I'm not saying that reprinting the enemy fetches here won't help the prices of them, they certainly will, but I am saying that they won't be affordable for long, if at all. 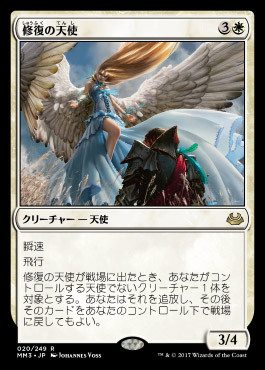 If we had seen this reprint in a block set, the prices would be less for longer. If you take a look at the Return to Ravnica shockland reprints, you will see that every single land is less than 15 dollars. This was because all of the lands were reprinted in main sets that had similar print runs that were able to exceed market demand. Their prices have not risen noticeably yet. Please note that the shocks are just as, if not more important, to a modern deck, and see a simmilar amount of play compared to the shocklands.